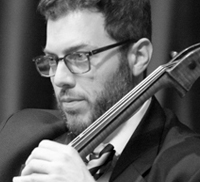 This Friday evening, May 4 at 8:00 and Saturday evening, May 5 at 6:00, cellist Nicholas Tzavaras (photo) and pianist Doris Stevenson will present Parts 1 and 2, respectively, of Beethoven’s complete works for cello and piano. On Sunday afternoon, May 6 at 4:00 violinist Daniel Phillips, violist Roger Tapping, cellist Natasha Brofsky, and pianist Marija Stroke will play works by Mozart and Faure. There are details for each concert and you may buy tickets here.